Closing of The Ramparts We Watch by the Pennsylvania Censor Board, Harrisburg, PA., September 1940.
Credit: Courtesy of The Historical Society of Dauphin County, at the John Harris/Simon Cameron Mansion, Harrisburg. 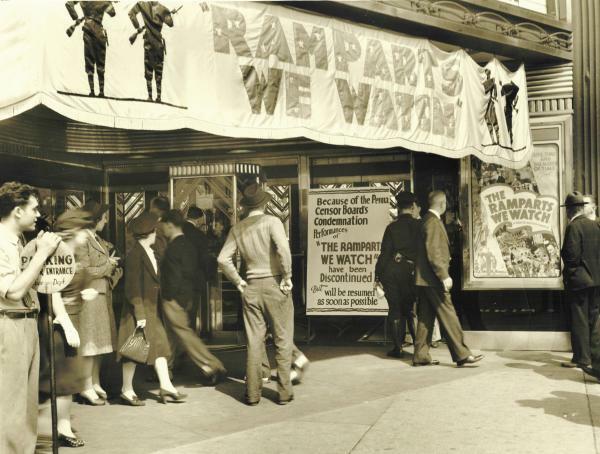 Fearing the "terrifying effect on the masses," the Pennsylvania Board of Censors in September 1940 banned the last sixteen minutes of The Ramparts We Watch, a Time Inc. docudrama designed to show the dire consequences that a lack of preparation for global warfare could have upon the nation. In response, producer Louis de Rochemont declared that only the Pennsylvania Board of Censors and the Nazis wanted to prevent the picture from being exhibited. Created in 1915 to protect vulnerable filmgoers from evil influences, the Board ceased functioning after its constitutionality was struck down by the Pennsylvania Supreme Court in 1956.